The Denny Hamlin Short Track Show Down once again presented it self at Richmond International Raceway to bring awareness and money to the Denny Hamlin Foundation which benefits Cystic Fibrosis research. The event has continued for many years now to be a premiere event that drivers of all levels look forward to. It gives the cup drivers who participate a chance to help raise awareness, while it gives the lower tier drivers a chance to race on a big track with some of the best. 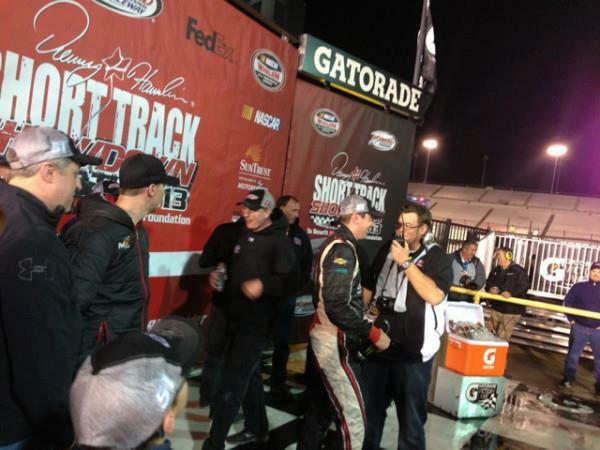 Kyle Busch took the win on Thursday night holding off David Regan for his third victory in this event. Meanwhile Michael Waltrip, Tony Stewart, and Trevor Bayne all did not finish the race due to wrecks. Some notable include Matt Kenseth who finished 22nd and Kyle Larson finished 10th. This goes to show just how competitive this field of drivers was. Kyle Busch was very intent on winning the race, so intent that his team built a car specifically for this race in order to control their destiny and win. Kyle joked afterwards asking if anyone would like to buy the car commenting “win on Thursday, sell on Friday”. In the end though everyone was a winner at the Denny Hamlin Short Track Show Down as the race benefited and brought awareness to many charities including those that fund Cystic Fibrosis.